'Kreacher would never move anything from its proper place in Master's house. ...Mistress would never forgive Kreacher if the tapestry was thrown out, seven centuries it's been in the family, Kreacher must save it, Kreacher will not let Master and the blood traitors and the brats destroy it..."
The Black Family Tree tapestry is a large tapestry which hangs at number twelve Grimmauld Place. It has, according to Kreacher, been in the Black family for seven centuries (OP6). On it the family’s births, marriages and deaths are embroidered with gold thread; family members who have been disowned have been “blasted” from the fabric (a small burn like a cigarette burn is where their name is). 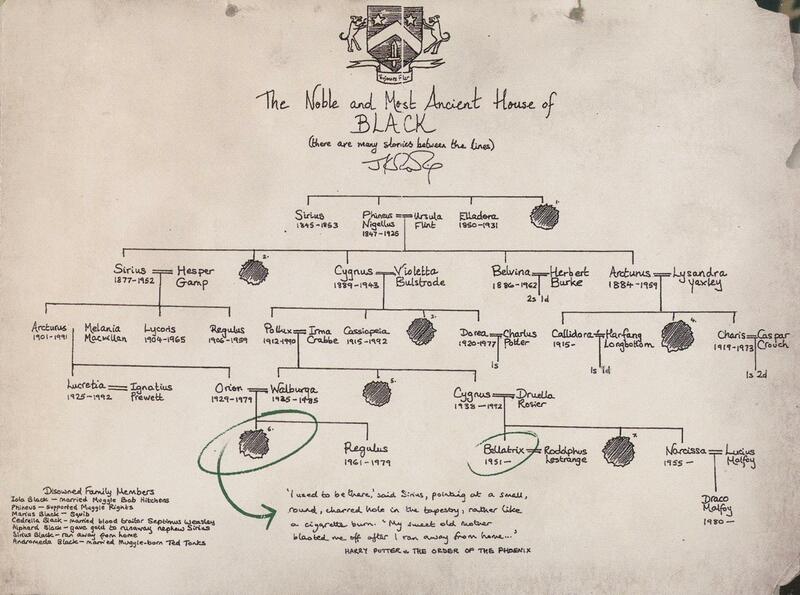 Click here for information about J.K. Rowling’s drawing of the Black Family Tree. "The Noble and Most Ancient House of BLACK," a hand-drawn tree that Rowling donated to Book Aid International in January of 2006 and auctioned February 22, 2006. Kreacher says that it has been in the Black family for seven centuries, so the portion that JKR drew is just a part of the whole. Sirius sees Araminta Melliflua on the tapestry, but she is not listed in the one Jo drew. The Lexicon's image was made in 2006, based off of two partial pictures, and a description by Aberforth the Marauder, (which was based on observation of the original during the auction.) Some dates were not correct in our original versions due to the imperfect sources. The original image has since been published in Harry Potter Film Wizardry and can be seen here. All the dates seen on the image above are now verified as correct except the birth year for Cygnus, as indicated above.